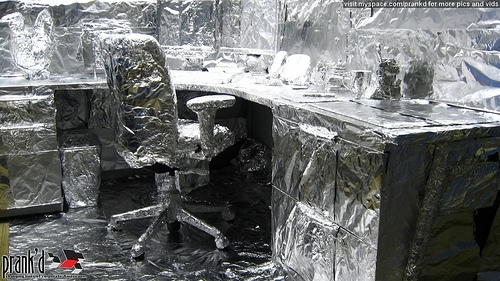 It’s that time of year again when your co-workers will be planning their summer vacations. Let’s admit it when a co-worker takes a week off for vacation the work load can sometimes double for you. That week seems like a month sometimes when you are really busy. Here is one way you can relieve some of that stress at the end of the week. 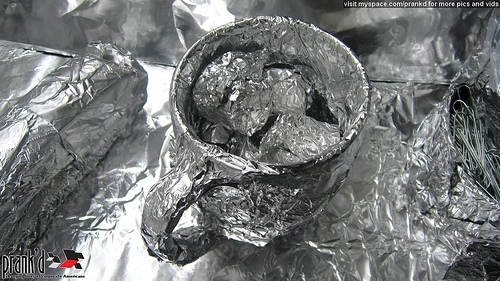 It’s called foiled! So this is what you are going to need, go on your lunch break and buy several restaurant size rolls of aluminum foil. Then start wrapping everything on their desk, chair, computer, books, pencils, etc.. This might take awhile so plan accordly if you have co-workers willing to help then it might be best to recruit them. Make sure to have a camera handy to take pictures of your work and also of your co-worker when they return from their vacation this will be priceless!! It looks like they were freeze dried….. What fun, do you think my boss would apprediate it? Oh my gosh Brian that is just too funny! awesome bob! you will one of these days for sure! !